An approaching winter storm started affecting travel in the Maritimes before it arrived as some flights were delayed or cancelled at Maritime airports. It's not quite snowmageddon in Toronto, but the weather clearly is not good. "I got out in time but the weather was getting progressively worse as we were taking off,” said Reema Fuller. The storm was causing big time delays and stranding passengers aplenty at Canada's biggest airport. Fuller landed at Halifax Stanfield International Airport around noon on Tuesday as she escaped Toronto just in time. “I'm sure if I had gotten a later flight I wouldn't have gotten out (Tuesday),” said Fuller. Len Lin and his girlfriend were supposed to fly from Halifax to Montreal to Shanghai and rather than sit at home, they went the proactive route. “We come here to double check the situation,” Lin said. If all falls into place, they'll fly out Thursday or maybe Friday. Sara Walker was another passenger playing the waiting game. Managers at nearby airport hotels told say they haven't received many delayed passengers yet, but they fully expect that to change on Wednesday when things get nasty in our region. 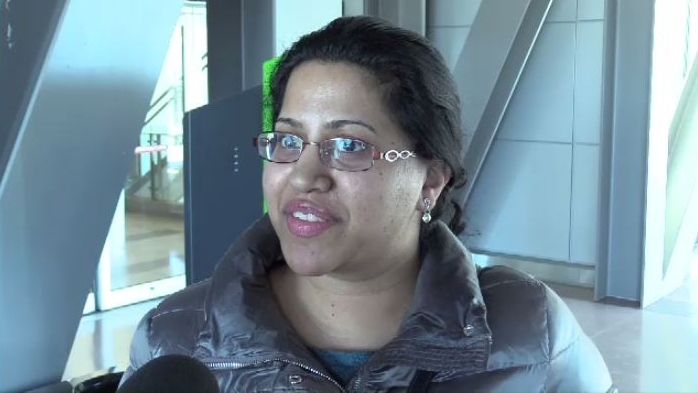 "I got out in time but the weather was getting progressively worse as we were taking off,” said Reema Fuller, who arrived in Halifax from Toronto at noon on Tuesday.